Advocates of divesting fossil-fuel investments protest at the president’s office at Massachusetts Hall. 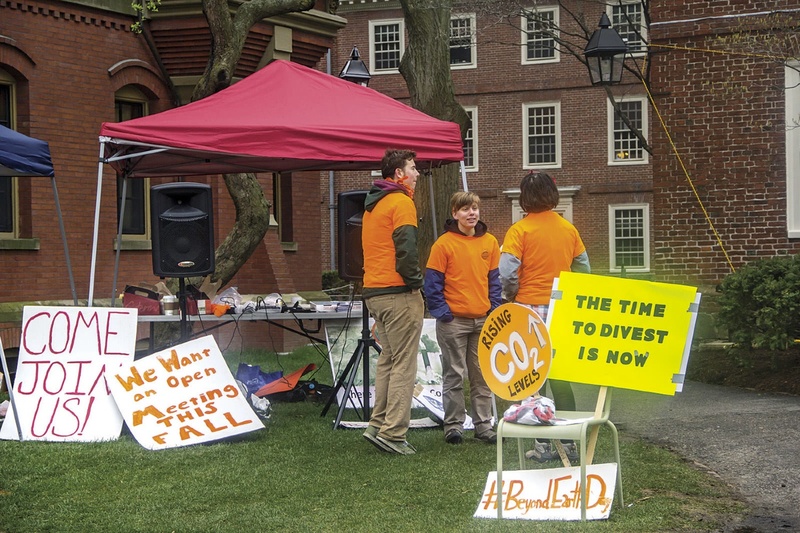 Advocates of divesting Harvard’s endowment investments in the fossil-fuel industry —part of a movement urging such action by schools nationwide—have bedeviled University administrators all year. On October 3, President Drew Faust issued a statement  calling climate change “one of the world’s most consequential challenges”—but expressing the belief that divestment is neither “warranted or wise.” Instead, she sketched, broadly, Harvard’s role in teaching and research on the environment; its efforts to reduce its greenhouse-gas emissions; and the role of Harvard Management Company’s (HMC) new vice president for evaluating environmental, social, and governance (ESG) factors in investing. Faust’s message linked to a graphic on various University research programs. She announced an initial $1 million in innovation grants (a favored recent tool to jump-start campus-based entrepreneurship) for faculty and student projects. And Harvard, she added, would sign the United Nations-supported Principles for Responsible Investment (PRI; voluntary principles for ESG analysis of investments) and the Carbon Disclosure Project (CDP), a nonprofit that seeks information on businesses’ energy use and greenhouse-gas emissions. The same day, the news office unleashed a supportive barrage of Harvard Gazette articles detailing professors’ recent climate- and energy-related research, policy guidance, and work on related issues. Placards mounted on A-frames around the Science Center Plaza touted the University’s own sustainability goals and progress toward its target of reducing emissions by 30 percent. All this proved a skirmish in the continuing disagreements. On April 10, Harvard Faculty for Divestment released their own “Open Letter” to Faust and the Corporation . Referring to the October 3 and April 7 missives rejecting divestment, the 100 or so signers, from diverse disciplines and schools, declared, “We believe that the Corporation is making a decision that in the long run will not serve the University well.” If fossil-fuel divestment is a “political” act, the letter went on, “continued investment is a similarly political act,” and then laid out the authors’ case—legal, scientific, and ethical—for selling the securities. To underscore the point, in a subsequent interview she told the Crimson (“Faust Says She Will Work with Faculty, Not Divest Group, to Discuss Climate Change”) that an open forum on the issue was not on the table. The newspaper quoted her characterizing the Divest Harvard demand as “a chance to draw attention to itself,” rather than promoting substantive discourse.